Well the Talon is gone. So time for my new project. Like I had said previous, I was looking for a more "mature" toy. Something a little more comfy, little more displacement, etc. Just driving it home, I already love it. I didn't feel every single crack/pot hole in the road, the engine just seems smooth and has a nice tone to it. The engine looks like it was recently detailed, it's clean enough to eat off of. There's a couple door dings, and a small amount of sun/paint fade on the front bumper, and a very small amount of surface rust underneath the car, but overall I was suprised with how clean it was! I think this is going to be a perfect fit for what I was looking for, in my price range. The leather must be recently re-covered also because it's in brand new condition (which ever other one I've looked at usually atleast the drivers seat is worn). - Whatever else is needed to support that turbo setup. My goals are to first just make sure all necessary maintenance is done, and the car is running in as tip-top of shape as it can be. Once that is done, make it a comfy street car, but with enough power that it can still get some occasional street ownage, and the occasional drag strip visit. 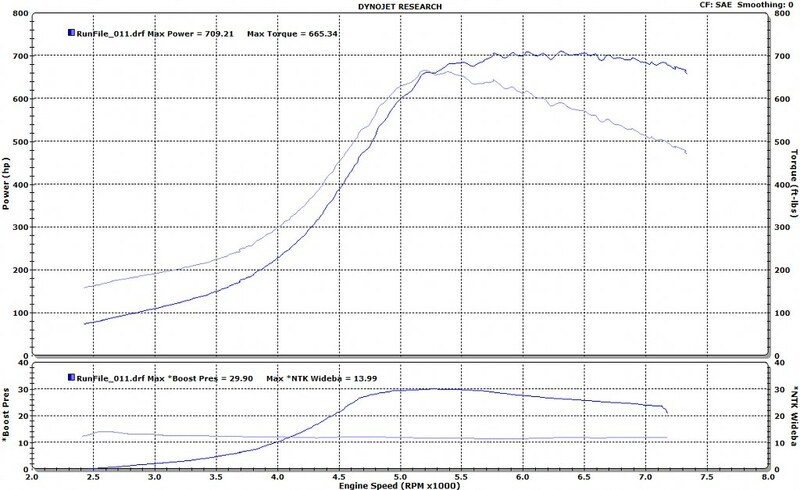 I know DB's dyno seems to read different between AWD and RWD, but going by the lower numbers that we are used to, I'm aiming for the equivalent to 600hp on that dyno, which would be something like 700hp at MAP or something like that. I plan on trying to take my time, not rush this project, and get it done over a period of time (not happening over night). Sometimes on the Talon, I feel like I rushed certain things, but on this one I want to make sure I take the extra time to do things as good as I can. It's kind of interesting because I'm starting on a new platform that I knew nothing about 3 months ago. I've been reading up a ton, and it's tough starting over as a complete newb again. Pretty sure I've already annoyed the hell out of Shane, and am probably on track to soon do the same to Mo and Cher. But I just want to say a big thanks to those guys for listening to my questions. Last edited by Halon; 10-06-2010 at 09:11 PM..
And more pics. This is all I have for now. Plan to give the exterior a good clean/wax when I have some time. That things way cleaner than the other pics showed. That interior looks like new! Nice! Nice. I don't think there is much of a difference in dyno numbers between MAP and DB if you are 2wd. At DB, my car put down about what I expected on a dynojet. Life's tough.... it's even tougher if you're stupid. Motorcycle cop pulls up next to me on UNI and says "Want to race?" Me- "I don't think you would stand a chance." Cop says "probably not" and drives off. For that price, damn that is a sweet deal Brandon! thing looks P.I.M.P! The interior looks spotless, and the rest of the car looks much better than the eBay listing. Have fun, this looks like an awesome project!!! Can't wait to see what you do with this thing. The fact that you were mega into DSMs and this car comes from Normal, IL is just plain creepy. Looks good, cant wait to see it once the turbo set up is on it. Fast, Cheap, Reliable. Pick 2. Nice that it actually came today! Cant wait to see where it goes. 2jz FTW! Thanks everyone! Yeah it's a bit scary buying something online like this, without ever having seen it before. I bought my Talon the same way online, but never even saw a pic of it. At least this guy sent me tons of pics, but I still wasn't expecting any kind of gem. But really, this thing is pretty deng clean. Not perfect by any means, but after going through it, it really exceeded everything I was expecting out of it. Same when I had bought my Talon, so I got lucky twice with my online car purchases in my eyes. And yeah the Normal, IL thing is kinda ironic But anyhow, just gotta get the sucker registered now, some insurance on it, and probably just enjoy it for the rest of the fall as it sits, and let the building begin over winter. Awesome project, looking forward to updates this winter. It's clean in person, even at night. Boy, the seller took it in the shorts seeing he wanted $5500 out of it. Mario Tetris 2 Champion! Tetris Champion! Tetris 2 Champion! Nice! He redid the interior leather. Glad you FINALLY got it though. Bout time! haha Nice car man! Looks great, the interior looks perfect! Location: White boy lake son. Looks good! Can't wait to see where you take it!